I’ve always heard this is a good sign. And look! 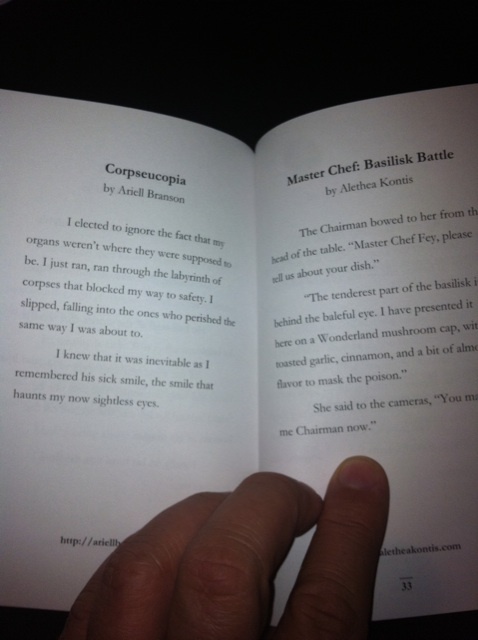 Here’s Ariell, whose 66-word story here appears BEFORE MINE in the 66 Twisted Tales chapbook. If you have a Kindle, you can get the book right here for only 99 cents! There’s a place in the mall near our apartment called Cookology. It’s a nifty little space dedicated to cooking classes of all shapes and sizes. There are huge picture windows, so that any given time, you can see what’s going on, who’s screwing up, and what’s for dinner. Now, I love to cook with alcohol (remember, my Campari-braised pear salad won the appetizer course in the Iron Chef Pear with Iron Chef Mary Robinette Kowal), so I was pretty darned interested in this particular class. Overall, unfortunately, I have to say I was pretty underwhelmed by the experience. 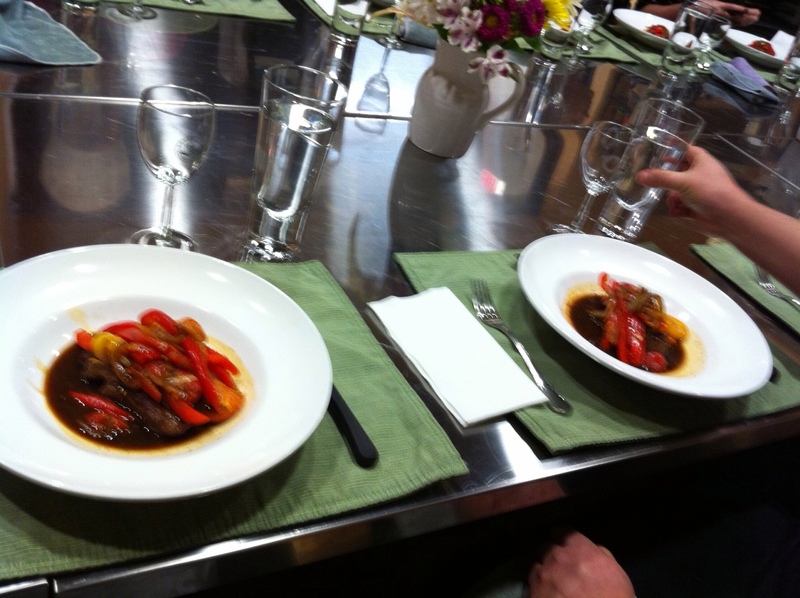 It was a great idea, but honestly…Joe and I are already pretty darned good cooks. We know our way around a kitchen, and aren’t afraid of experimenting. While I do need to work on my knife skills, and I will never beat Chef Anne Burrell at, oh, anything except maybe having better hair, I wonder if maybe our high level of competency contributed to our general ennui. I also wasn’t that thrilled with the beer as an ingredient. In the main, it is bitter at its base, and a little goes a long way. (In hindsight I definitely would not have added the too-powerful braising sauce to the plate, as shown here.) I enjoyed the technique of wrapping the vegetables in paper to steam them with beer in the oven…but I’ve achieved far more flavorful and successful outcomes using a saucepan. And everything was far too over-spiced. It’s a crime to get hand-fed, organic Nebraskan USDA choice meat and then cover it in, well, anything but a sear. I will say, the Moelleux au Chocolate we made for dessert was divine — and I’m not such a huge fan of chocolate — but I was so starving by the time we sat down that I inhaled my less-than-stellar entree, and then ate FAR too much of the chocolate dessert…which I later regretted. The other regret was that the chef did not sit down to dine with us, instead leaving us to our own devices at a table with 16 other perfect strangers so he could go home and “have a Lunchable and go to bed.” I understand if he had no desire to “eat his work,” as he put it, but I felt like I’d just been given the brush-off. It’s just not the way I was raised. Heaven knows I give Joe and the girls enough crap when *they* leave the dinner table early. It’s just not done in our family. I don’t care what excuse you have. If this class taught me anything, it was 1.) stick to the liquors and wines for cooking and 2.) Joe and I just need to find more crazy things on the internet and try them out ourselves. Last night’s Iron Chef America rerun was the Maple Syrup Battle. The Vermont girl in me says we go for it.